Costume Candidate for 2013: Inanna-Ishtar | Take Back Halloween! Thanks to our Kickstarter campaign for 2013, we’re adding 19 new costumes this season, 7 of which our backers and supporters will get to vote on. This series of posts is designed to briefly introduce the many notable women and legendary figures we’ll be considering. Voting will take place spring/summer of 2013. Before Freyja or the Morrigan, before Venus or Aphrodite, before Artemis or Athena or Demeter or Persephone, there was Inanna. She was the great Mesopotamian Queen of Heaven and Earth, the goddess of love, fertility, and war. In her earliest form, perhaps 6,000 years ago, she may have been the supreme giver of life and civilization. 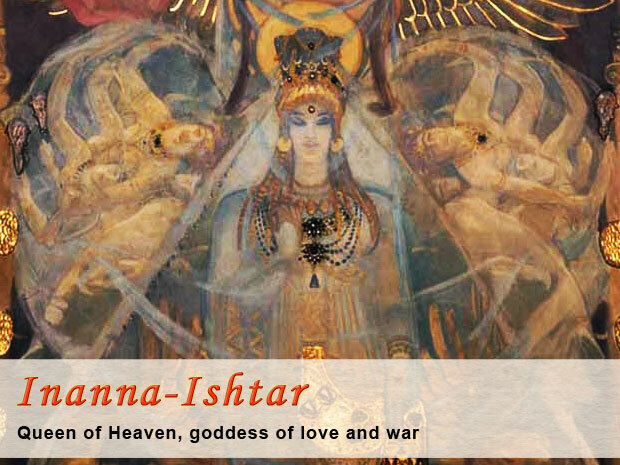 Inanna was what the Sumerians called her; their Semitic neighbors, the Akkadians, called her Ishtar. As time went on the Sumerian language was entirely replaced by Akkadian, and thus Ishtar is the name that endured. It was as Ishtar that she was worshiped by the later Babylonians, the Assyrians, and the Canaanites, who pronounced her name something like Ashtart. (In the Bible she is called “Ashtoreth,” which scholars think was a deliberate play on words, combining “Ashtart” with the Hebrew word “bosheth,” meaning abomination.) When the Greeks came along, they rendered her name as Astarte. So who was this amazingly long-lived goddess whose cult lasted for 4,000 years? In the early days she was probably the most important deity in people’s lives, the main god they prayed to and thought about. The earliest known religious literature was dedicated to her, and texts like The Descent of Inanna (describing her journey to the underworld, death, and return to life after three days) indicate that she was the focus of profound theological contemplation. She was pictured as the eternally youthful embodiment of the life force: perpetually a virgin (signifying independent female power) yet full of passion and enjoying many lovers. The fecundity of fields, flocks, and humans were in her care. In her role as the morning and evening star (the planet Venus), she was the queen of heaven, with the zodiac as her girdle. She controlled the arts of civilization, and her mystical marriage to the king was what gave him sovereignty. As society became more warlike, so did she, and by Babylonian times she was positively bloodthirsty, exulting in the death of the king’s enemies. Over the millennia the focus shifted more and more to the goddess’s relationship with her son-consort, Tammuz. The original story of Inanna’s descent to the underworld gradually became a story about Ishtar resurrecting Tammuz from a sacrificial death. It was this latter form of the myth that permeated the ancient Mediterranean world; traces of it appear in the Greek story of Demeter and Persephone and in the Hellenistic mystery cults of a dying and resurrected god (which provided the theological climate in which Christianity emerged). Meanwhile, the love goddess aspect of Inanna-Ishtar survived in the classical pantheon as Aphrodite-Venus. And thus this originally Sumerian goddess is, in many ways, still with us. When you look at Botticelli’s Venus on the half shell or contemplate a statue of the Virgin and Child, you’re seeing a faint reflection of the great Mesopotamian Queen of Heaven. Think we should add an Inanna-Ishtar costume to Take Back Halloween? If you missed our Kickstarter campaign you can still become a supporter and get to vote on the new costumes. Illustration credit: The painting of Astarte is from the mural Triumph of Religion (1895) by John Singer Sargent.